A musical father and daughter relationship is no guarantee of the offspring's talent; for every Frank and Nancy Sinatra there's an Ozzy and Kelly Osbourne, for every Johnny and Roseanne Cash there's a Billy Ray and Miley Cyrus. No such concern when it comes to Mollie Marriott. Mollie is the daughter of the late, great, Small Faces/Humble Pie legend Steve Marriott and also the stepdaughter of UK singer/song-writer Joe Brown. Though only twelve years old when her father tragically passed away, the Marriott genes truly shine through into Mollie's talents. Her musical career began when she was asked to sing backing vocals on Oasis' 'Heathen Chemistry' album at the age of just fifteen, and in 2001 she sang backing vocals at the Astoria Memorial concert for her father, leading to her going on to sing with the likes of Brown, Mark Knopfler, The Who, Jeff Beck and Paul Weller. 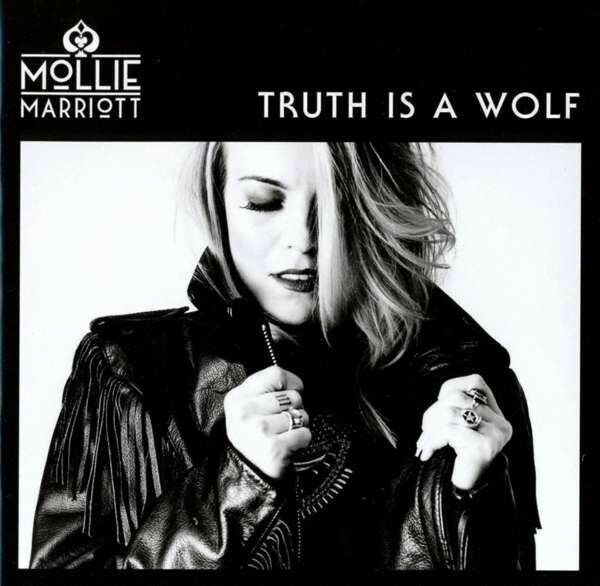 An album that has been four years in the making, 'Truth Is A Wolf' has been preceded by three singles, 'Ship Of Fools', 'A Million Miles' and 'Transformer' (with only the latter included on the album) that demonstrate the eclectic nature of Mollie Marriott's music and vocal delivery. Effortlessly able to flit between Blues, Soul, Rock and Pop, all delivered with pure emotion, power and an impressive range alongside deeply personal lyrics, it's clear Mollie Marriott's determination to be recognised as an artist in her own right and not just ride on her father's coat-tails will be easily realised. Lead-off track 'Control' is a sassy, feminist anthem and the liveliest song on offer, whereas the remainder of 'Truth Is A Wolf' slips into the sultry, mid-tempo groove of the Fleetwood Mac/Pop crossover of 'Broken' and 'Run With The Hounds', or the sophisticated Blues Rock (with a Grungy undercurrent) of the title-track and 'King Of Hearts' – both featuring guitar contributions from Weller. Ballad-wise, 'Love Your Bones', the darker 'Transformer' and impassioned 'My Heaven Can Wait' stir the emotions, while the Gospel-tinged slow Blues of 'Give Me A Reason' is a thing of pure beauty. An introspective release that isn't the standard 'Fireworks' & Rocktopia fare, but Mollie Marriott's talents as a lyricist and performer, let alone her stunning voice, ensures a lengthy career awaits – Steve Marriott would be proud.